1. 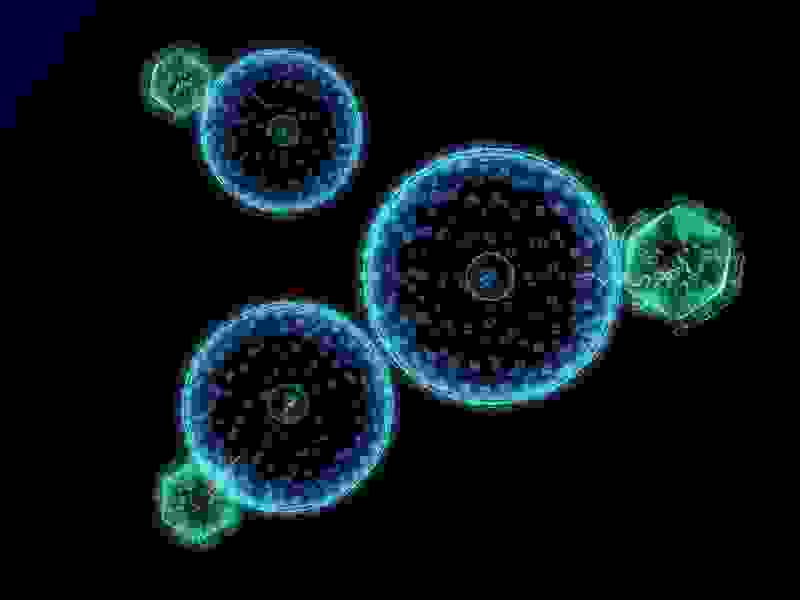 Are viruses cellular organisms? Viruses are considered living organisms but they do not have a cellular structure. There is some controversy regarding their classification as living organisms. However, the fact that they self-replicate and have genetic material reinforces that classification. 2. What is the basic structure of a virus? Viruses are made up of genetic material (DNA or RNA) covered by a protein capsule also known as a capsid. Some viruses, like HIV, also have an external envelope produced from the plasma membrane of the host cell from which it came. 3. Are there non-parasitic viruses? All viruses are obligate intracellular parasites, meaning that they depend on a host cell to complete their life cycle. A virus does not have its own metabolism. 4. What is the basis of the evolutionary hypothesis that although viruses are the simplest organisms, they were not the first living organisms? The fact that viruses are obligate intracellular parasites makes it very unlikely that viruses appeared before cellular organisms during the evolution of life. 5. What is the genetic material of a virus? What is the role of that material in viral reproduction? Some viruses contain DNA (double stranded or single stranded DNA) and others contain RNA viruses (double stranded or single stranded RNA). Viruses inoculate their DNA or RNA molecules into cells and these cells (by means of transcription or reverse transcription and translation) synthesize proteins for the assembly of a new virus. This synthesis is controlled by DNA or RNA molecules of the virus. 6. What is the typical reproduction cycle of a DNA virus? A typical virus has proteins on its capsid that bind to the outer membrane of the host cell. In the place where the virus attaches, viral proteins act to break the cell membrane and then the virus injects its DNA molecules into the host cell. Within the host cell, the viral DNA is transcripted and messenger RNA is produced. Viral mRNA is then translated and viral proteins are made. Viral polypeptides made within the host cell are cut by enzymes called proteases and then copies of the virus are assembled with the newly formed proteins. When the assembly of new viruses is complete, the cell membrane breaks and the viruses are released to the outside. One sole infected cell can produce hundreds of viruses. 7. What are retroviruses? How do they reproduce and what is the role of the enzyme reverse transcriptase? Retroviruses are viruses whose genetic material is RNA. HIV and the SARS (severe acute respiratory syndrome) virus are examples of retroviruses. These viruses inoculate their RNA into the host cell and, within that cell, viral RNA is reverse transcripted into DNA. DNA made from viral RNA then controls the synthesis of viral proteins for the assembly of new viruses and the rupture of the host cell to releases them to the outside. The enzyme reverse transcriptase is the catalyst for the reverse transcription of RNA into DNA. This enzyme is part of the virus and is also inoculated into the host cell. 8. What is the basic structure of the HIV virus? What is the function of the glycoproteins in its envelope? HIV is an RNA virus. At its core, there are two strands of RNA and reverse transcriptase molecules. The core is covered by a capsid, which is a layer of proteins. The capsid is then covered by an envelope containing glycoproteins and lipids. The glycoproteins of the HIV envelope are located on the outer surface of the virus and they responsible for recognizing the cells to infect (the HIV host cell is the CD4 lymphocyte) and for attaching the virus to the cell membrane. (CD4 is a receptor glycoprotein of the outer membrane of some lymphocytes). Bacteriophages are viruses specialized in the parasitism of bacteria. They are used in genetic engineering as molecular cloning vehicles to insert recombinant DNA into bacteria. They were also used in the former Soviet Union to treat bacterial infections. Bacteriophages have a polyhedron-like capsid and use DNA as their genetic material. The “head” of the virus is connected to a tail that ends in small fibers, which helps the virus to attach to the bacterial cell wall and to inject its genetic material into the host. 10. What does it mean when a virus is in an inactive state? Viruses considered to be in an inactive state are those whose genetic material is within host cells that are not carrying out the synthesis of viral proteins and the assembly of new virus. The life cycle of these viruses can be activated under certain conditions, causing the synthesis of viral proteins to begin, and producing new copies. The virus that causes herpes (herpes virus) is an example of a virus that stays in an inactive state and is sometimes activated. 11. What are the main human diseases caused by viruses? Among diseases caused by viruses are the common cold, the flu, mumps, smallpox (considered eradicated nowadays), rubella, measles, AIDS, viral hepatitis, papillomatosis (HPV infection), rabies, dengue fever, yellow fever, poliomyelitis (a disease almost eradicated in developed countries), hemorrhagic fever from the Ebola virus and SARS (severe acute respiratory syndrome). Viruses also cause many other diseases in animals and plants. 12. SARS is a disease that appeared in 2003 with epidemic features in the province of Guangdong, in eastearn China. What type of agent causes SARS? SARS is caused by a virus from the coronavirus group, an RNA virus (retrovirus). SARS can be fatal. 13. What is the crystallization of a virus? What is the importance of this process? Crystallization is the process of the transformation of viral components into organized solid particles. The crystallization of biological macromolecules, including viral components, is used to study structural characteristics, through X-rays or laser beams, for example. Study the next subject: go to Life Kingdoms.